In this week's edition, we talk with Katie Hornstein, a specialist of nineteenth-century French art and visual culture. Her book, Picturing War in France, 1792–1856 (Yale University Press, 2018), examines representations of contemporary conflict in the first half of the 19th century and how these pictures provided citizens with an imaginative stake in wars being waged in their name. Katie also recently co-edited Horace Vernet and the Thresholds of Nineteenth-Century Visual Culture (University Press of New England, 2017) about the artist Horace Vernet, who, although popular during his lifetime, was reviled by the poet Charles Baudelaire and thus consigned to relative obscurity. In this interview, Katie speaks about her single-authored monograph, Picturing War. My book deals with the emergence of a public in France after the French Revolution that was eager to consume pictures of war: these pictures were (relatively) easy to understand and often fun to look at, though they were also violent. I want to know what this tells us about the political and artistic culture of the late eighteenth and early nineteenth centuries. From my cat. And from primary sources, especially works of art. For research, I could not live without Gallica (the digital portal of the Bibliothèque nationale de France), museums, curators, and my colleagues. I hope that it will still contain a lot of books. The digital world is wonderful, but I think it's important to know how to browse the shelves and be surprised by what you find. Put down your phone and make space for non-distracted thinking. I just read Goodbye Vitamin by Rachel Khong and some salacious French revolutionary historical fiction by Hilary Mantel (A Place of Greater Safety); at the moment, I'm contending with a pile of old New Yorker magazines that have gone neglected in recent months. The American Art-Union was founded in 1844 in New York City, with the aim of promoting the fine arts through its publication, which was available as membership subscription, and eventually through its art gallery, which was free and open to everyone. Inspired by European models, the membership subscription entitled members to receive the annals and transactions, including prints and engravings of famous works, as well as an opportunity to participate in an annual lottery for a painting by a well-known American artist. The original aim was to focus on art that had an American character or appeal, and images of the American landscape and country life predominated. The American Art-Union also endeavored to provide artwork that represented all of America without a regional bias. As this was the era of abolition, a politically charged atmosphere reigned over all public spheres, and it seems as though their aim to be unbiased created a bias. Eventually, the union became embroiled in anti-abolitionist politics and was accused of running an illegal lottery, which led to its downfall. However, the union had inspired other American cities to develop their own art unions, and the free and open to the public art gallery changed the greater public perception of art for the masses. 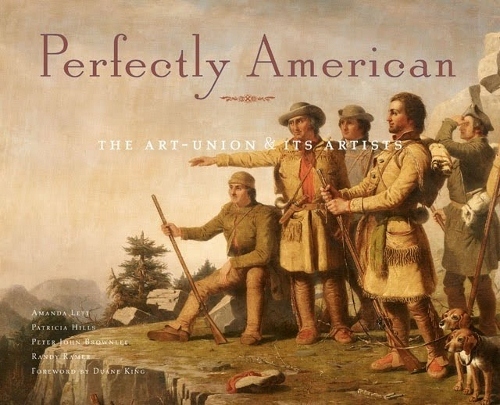 Few scholarly monographs have been published on the American Art-Union until Perfectly American was published in 2011, presenting new scholarship on this important aspect of American art history. This volume can be found in the Sherman Art Library, N6510 .P47 2011.